Milk and milk products can be hard to give up, primarily because we’ve been led to believe they’re an essential part of a healthful diet. This is not surprising, given the millions of dollars spent on milk ads and that most doctors recommend osteoporosis patients to drink milk. But the truth is that milk is neither nutritionally essential nor a good source of calcium for your bones. And your body knows it, so if you need more reasons to continue on a milk-free path, this post is a must-read. Today you’ll discover four signs that show your body and bones don’t like milk, regardless of what your taste buds tell you! Let’s begin with arthritic aches and pains, symptoms that you may not associate with dairy intake. Milk acidifies the body due to its high animal protein content. The pH of pasteurized milk ranges from 2 to 4, with processed, pasteurized milk having the lowest, and therefore most acidic pH. Not coincidentally, arthritis can be attributed to a build-up of acid in the system, leading to joint deterioration and pain. And of course, an acidic body environment reduces bone density in addition to inflaming joints. In fact, it sets the stage for chronic inflammation, which increases fracture risk. Milk does contain a significant amount of calcium, but the irony is that milk is so acidifying that the calcium does not get absorbed. In fact, the opposite is true – you actually lose calcium if you drink milk, because your body takes it from your bones to neutralize the acidic environment created by it. Milk contains high levels of a substance called tryptophan, which is necessary for serotonin production in the brain. Among other roles, serotonin helps regulate the sleep cycle, and is actually required for melatonin production. But there are plenty of bone-healthy foods that promote sleep, such as chickpea-based hummus, and even some that contain tryptophan, like almonds. There’s another way that milk can make you feel tired: it’s hard to digest (more on that below), which can simply drain you of energy. In addition, milk contains opiate-like substances, which we’ll take a look at next. It’s a very unpleasant experience when you feel like you just can’t get your thoughts together, and your brain feels sleepy and sluggish. The reason may be your glass of milk. Milk contains casein, a protein that is specific to mammalian milk. In cows and other ruminants, alpha-lactalbumin and beta-lactoglobulin make up the majority of the casein proteins, with the latter being the culprit behind most milk allergies. To compound the casein problem, a mutation in the beta-lactoglobulin casein (or beta-casein for short) has been detected in some cattle (but not goats or sheep). The mutation results in a proline molecule being replaced by a histidine molecule, which makes for a much more problematic casein. Here’s why. Histidine is not as strongly bonded to an amino acid called BCM7, one of many amino acids that make up casein. Because of this, BCM7 gets released in the GI tracts of anyone who drinks the milk, where it shows up in blood and urine. And BCM7 has a powerful effect on the brain (more on that below). How Does Casein Affect The Brain? Research has also indicated that BCM7 absorption is much less in individuals who have a healthy digestive tract, which brings us to the next point. 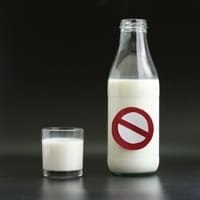 You may think you can tolerate milk, but just because you do not have the classic symptoms of lactose intolerance or a milk allergy doesn’t mean it’s agreeing with you. Conditions like reflux, GERD, indigestion, abdominal pain, diarrhea, and constipation can all be related to dairy. 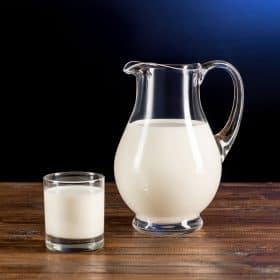 The experiential evidence is significant here, too – many, many people have found relief from reflux and ulcers when they stopped drinking milk. Yet doctors still recommend milk for upper GI conditions! I’ve heard from many Savers who were once plagued by GERD or reflux, only to find their symptoms disappeared while on the milk-free Osteoporosis Reversal Program. When you give up drinking milk, it gives your digestive system, including your liver, a much-needed break. Ready To Give Up Milk? If you’re still drinking milk, a good place to start is with a cleanse, where you focus on liver-cleansing foods and eschew milk and dairy products. 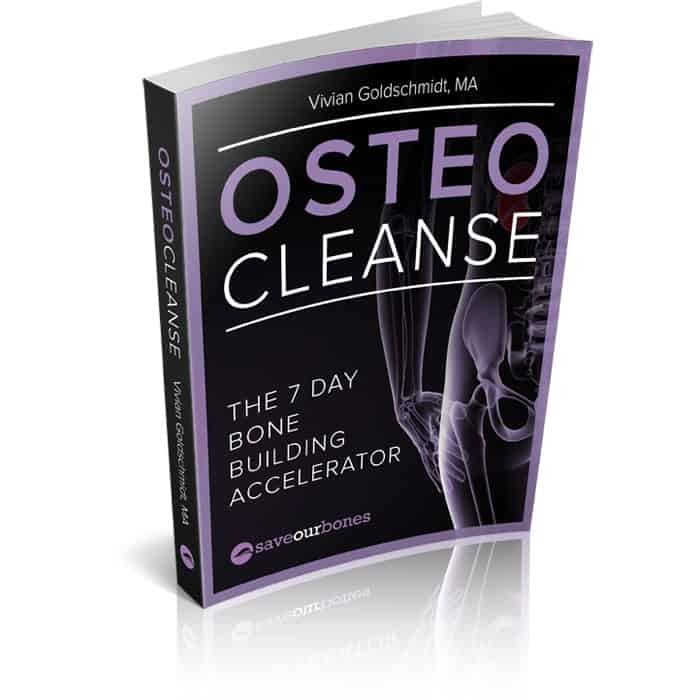 OsteoCleanse™, The 7 Day Bone Building Accelerator, is a week-long cleansing plan that does not include milk. Instead, OsteoCleanse™ emphasizes pure water with cleansing lemon juice and foods that detoxify and hydrate, like artichoke, parsley, cucumber, cruciferous vegetables, and watermelon. And there’s more to OsteoCleanse™ than just foods and drinks. It consists of six easy steps, including how to cleanse with proper breathing . After just one week, you can look forward to more energy and vitality, better liver and kidney function, a younger look, better sleep, and accelerated bone building. OsteoCleanse™ also helps you remove other toxins and osteoporosis drugs you may have taken in the past. 2 Scifo, R, et al. “Opioid-immune interactions in autism: behavioral and immunological assessment during a double-blind treatment with naltexone.” Ann Ist Super Sanita. 1996; 32(3): 351-9. I make and drink about a qt. of kefir a day. It is made with raw milk and double fermented with dried apricots and stevia. Is that too much to drink or ok? What about raw milk cheese? This article is full of misinformation. First of all milk doesn’t have a PH of 2-4. It is more around 5-6, AFTER it has been pasteurized. Therefore it is only slightly acidic. Secondly, there was a study done where subjects were given radioactive calcium. They were then fed high protein diets…beef, milk, etc. They found that the majority of the calcium (90%) secreted in the urine was from the food itself. Therefore you are more likely to have calcium loss from drinking coffee than milk. I think you need to update your facts a little better! When I drink milk after a few days from not having it, I find that it tastes as if it’s curdled in my mouth, but what I think is happening is that my tongue is no longer acidic and it immediately notices the acidic nature of the milk. Wildly interested in this, but no dairy and no beans is fiakerng me out. I could cut dairy to some extent. I do love me some coconut milk, so that would be fine. But no legumes? Oh how I love my legumes! I am a 51 years old women who had a premature menopouse at of 37 and couple of days ago diagnosed with advance osteoporosis. I never missed my diary product including milk. Majority of time had organic milk. Had my caltetate with vit D, added with other minerals. Apparently none of them helped:(;(. I have bad knee pain. I was wondering if you have any recommendations for it. Greatly appreciate all your great research and it is an eye opening for me. Maybe is a good answer. Hydrochloric acid has a ph of 2 or so, my milk has a ph of 6.5. Sour milk could go as low as 5 but around 6 it begins to sour, lower would be unusual as a ph lower than 5.5 would be so sour that you would spit it out and the smell would repulse most people. My family takes in a moderate amount of milk and milk products. our livers are fine and overall we are healthy for 70 year olds Our big problems are sugars and carbonated drinks but I have found moderation to be a key in this as well. Moderation in all things is something most people do not practice. Mos studies and those conducting them have an agenda as the studies you quote. Still my studies tend to prove that Raw milk and milk products taken in moderation have no health risks. My mother died at 89 my father lives and is 89 and still works. My grand mother died at 92 my grand father died at 92. Average age at death of my family is 86. Exercise is a key to work with moderation. Balance is also important. Tomatoes are very good for you and the juice is very tasty yet acidic. I love egg plant and cabbage. my wife love eggplant and cabbage so we eat a lot of egg plant and cabbage so goes our moderation. We love sweet potatoes and my wife loves Brussels sprouts, I tolerate the little cabbages, well I eat them when served. I eat eggs 2 or 3 times a week. oatmeal with cream of wheat 2 to 4 times a week and rice crispies or kixs 2 to 3 times a week. We walk and work with the grand kids. I go door to door in the ministry. We go with Mike and exercise program 30 minutes every other day. So I would say exercise and moderation are a key. Environment also plays a key role as well as genetics. Health is complicated and bad health cannot be tied to one thing. In The end you will die and nothing will stop that. Now anxiety kills so worrying about eating can cause some very bad health effects. Not sleeping can kill your organs. Not drinking enough water can kill your organs. You need sunlight but not too much. You need laughter and in abundance. You need the human touch and we need to be needed. psychology has a great deal to do with health and milk will not hurt that. So If your family has health problems then you may. If you live in an area that is polluted you may. If you do not get exercise you may. If you don’t get restful sleep you may. If you do not do all things in moderation you may. If you smoke you may. if you don’t interact with other living things you may. If you have no hope for the future you may. And last of all If you worry too much you may have poor healt. If you are good in all of these areas and still have poor health there is another list of things. Eat fruit, grain, moderate meat intake, watch out for soy too much will hurt you, moderation.Seaweed is good as is mushrooms, love mushrooms. I love to pick them gets me out in the woods. I really like asparagus and fresh broccoli. Lima Beans are gook with a ham bone, a little meat on the bone is good. Well gotta go. Best wishes to all and if they have a book to sell don’t buy it.It will be a new agenda for you and it will not address the true problems. What’s the findings on Hemp milk? Unsweetened kind. I have read several of these articles about milk being bad for your bones, but there is never a notation about HOW MUCH milk say per day is destructive. I drink one glass of skim milk per day, about 8 oz., plus calcium citrate as a supplement, eat non-fat Greek yogurt several times per week, and do weight bearing upper extremity exercise (among others). Your opinion please. Dear Vivian – How do you feel about rice milk & almond milk? Are they good for our bones & our health in general? Thank you for all your hard work. We really appreciate everything you do for us. I use unsweetened almond milk and find it to be a delicious milk alternative. 🙂 Rice milk is acidifying, but can certainly be used as a milk substitute as long as its acidifying nature is taken into account and you balance it with alkalizing foods and beverages. Thank you, Vivian. That’s great because I like the taste of almond milk & don’t particularly care for rice milk. Also unsweetened almond milk is lower in potassium which is good for me because my potassium is a little bit too high. You just told me exactly what I wanted to hear! Many thanks again. What do you think about Strontium as a supplement along with the Osteopro calcium. I heard, at the health food store, that many women had experienced good results. Please, Vivian, or someone, clarify for me: I do not drink milk for some time already. contains lactose, how it is ok to eat it? When active yogurt cultures are added to milk, they digest the sugars in the milk. End product is yogurt. Plain yogurt is a bit bitter for that reason. So in answer to your question, most of the sugars have been digested for you! Greek yogurt is made by removing the whey protein from the yogurt. That’s why it’s heavier and thicker. I eat organic plain Greek yogurt just about every day. With my own frozen berries on top, they infuse into the yogurt as they defrost. That’s plenty sweet! of milk, it contains lactose, how is it ok to take it? Rosario, lactose-intolerant people vary a bit in how much lactose they can tolerate. The fermentation process that produces yogurt helps break down some of the lactose, so some lactose-intolerant people are able to consume yogurt without a problem. I never drink milk but I a square of cheese at night. I’m guessing that is not good either. ?? There are also health coaches available for members. I have not used them but am considering doing so. Is yogurts ok? I’ve heard that it is good fir your bones even though milk is not. So what is wrong with SKIM milk in decaffienated lattes? Skim milk is simply cow’s milk with the fat removed, making it an even more processed form of milk. Removing the fat doesn’t remove the casein or other bone-damaging constituents present in milk. I read your book. It gave me the courage to not use the strong medicines prescribed by an endocrinologist. I’ve been using distilled water. However, I read an article out of Johns Hopkins, that said distilled water has a lot of acid. I haven’t stopped drinking it but I’d like to hear from you an explanation. I’m confused. PS I sent this message once before but I have not yet received an answer. Also, I have been following your nutritional recommedations and your exercises. Thank you! Anyone seen this awesome cokoobok? known as Chef 790 Secrets? My partner shed about 13 excess pounds in merely a month soon after eating food from the cook book! You have to google the website I cannot recall the address. Are there any dairy products that are ok, like feta which is from goat milk? Fermented diary products – particularly those from grass-fed, humanely-treated animals – are alkalizing and good for bones. Examples include kefir, plain, organic yogurt, and some sour creams. But cheeses, regardless of which animal’s milk they’re made from, do not fall into this category, because they do not contain live and active probiotic cultures. I paid $27.00 for a Liver Cleanse and was never able to access it. I don’t recommend any mammalian milk, Bob – it’s still an acidifying animal protein with naturally-occurring hormones and nutrients that are intended to grow and nourish baby goats. What about the occasional use of cheese for tacos? I recently found a grass-fed source of organic yogurt, which I enjoyed as a treat, the last thing I would eat after dinner. I haven’t had milk for a beverage in years. I use almond milk for protein drinks and smoothies. Can anyone comment? Thank you.